The twin-engine Wellington was the mainstay of Bomber Command until 1942, when the four-engine heavy bombers entered service. The Wellington prototype took to the air for the first time in June 1936 and production models entered service with the Royal Air Force in October 1938. Like the USAF C-47, the Junkers Ju 52 tri-motor was first built in the 1930s and remained in service for more than a quarter century. 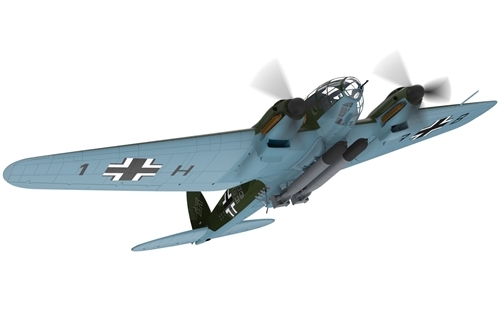 It made its maiden flight in April 1931, and three years later a heavy bomber variant entered service with the German Luftwaffe. The Handley Page Halifax was one of the British front-line, four-engine heavy bombers of the Royal Air Force during the Second World War. A contemporary of the famous Avro Lancaster, the Halifax remained in service until the end of the war, performing a variety of duties in addition to bombing. Entering service at the beginning of 1942, the Lancaster's design grew out of a failed predecessor, the Avro Manchester. While its' airframe offered a stable platform for heavy bombing assignments, the Manchester's twin engine design was inadequate to the task.